FAQ Revolution tries improving the classical question-to-static-answer scheme by introducing a choice-based system. Features a great search system allowing custom keywords definition and brings also a Knowledge-base section for your site. Everything focusing on SEO! Why should it be a revolution? A relevant part of the web is about questions & answers. Just think about it: how many times you search for answers? It’s up to websites answering in the best way possible and give users what they are searching for. Normally FAQ systems are composed by collapsible accordions containing static text, but are they really efficient? FAQ revolution inherits LCweb support site’s experience (serving more than 37.000 customers since 2015) and makes a step further, introducing new concepts such as semantic search helper and choice-based FAQs. Plus, it adds a real knowledge-base section to your website. You can link articles as well as external links to each FAQ, creating an unbeatable user experience! Static answers can’t be efficient with questions involving many variables or leading to sub-questions. Here’s where choice-based FAQs makes the difference: giving users targeted answers to their questions! 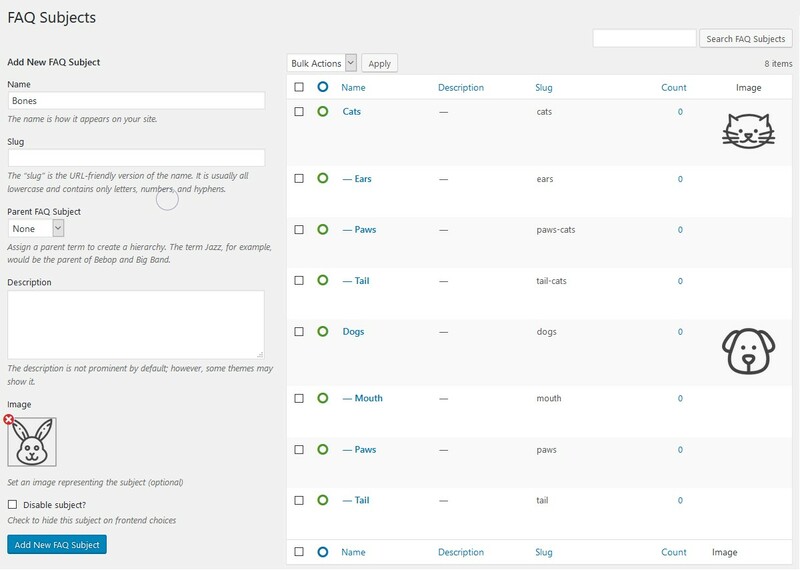 Through an intuitive buider you can shape-up your cases tree, analyzing user’s situation. Just as you were talking face to face! Each answer may end with a custom or predefined text… or you can also continue querying the user to better understand its situation. 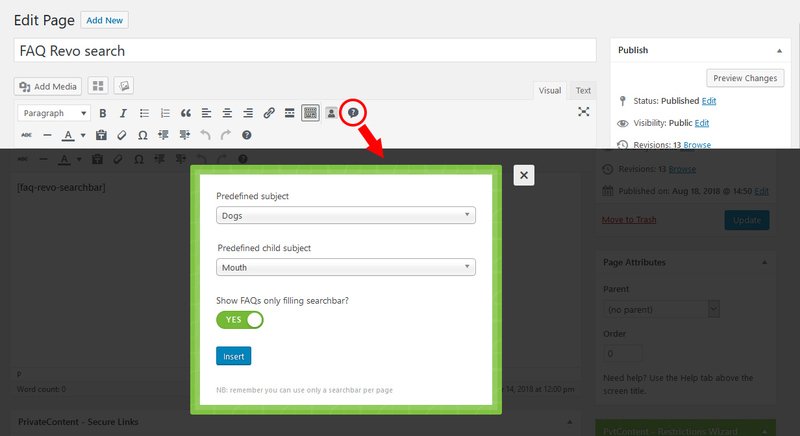 As you can see in this demo, each answer may also contain a photogallery and links leading to inherent pages. Everything has been thought to give the best answer in the easiest way possible. What really makes the difference is how efficiently you can give users what they are searching for and, in most cases, different users won’t use the same keywords. You can specify extra words to be matched by the plugin, helping different people finding the same answer. Teached users won’t have trivial questions and will enjoy your services! However is also important to have a clean and exhaustive site’s section explaining how things work. FAQ Revolution automatically creates this section! 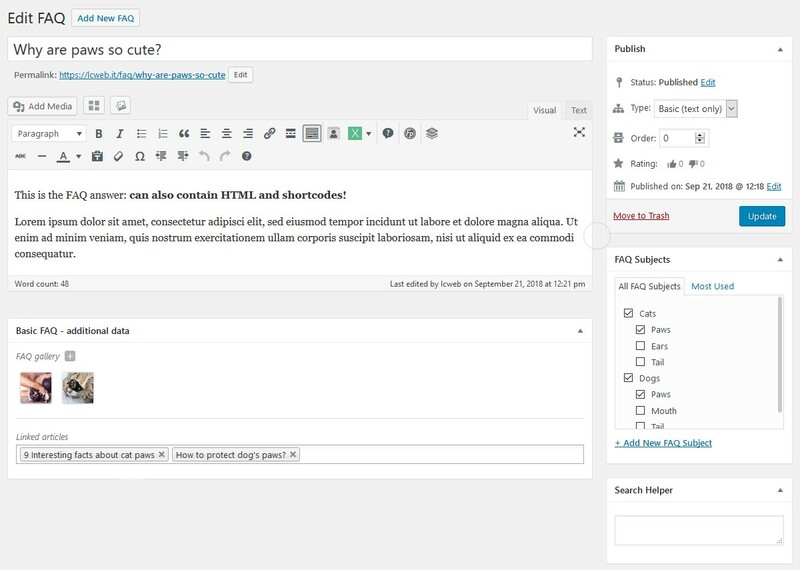 You just have to focus on articles creation, maybe tagging them to be quickly grouped! Sometimes you may also want to insert external references to existing web pages: the plugin also brings a links database section meant to keep them in the cleanest and quickest way possible! 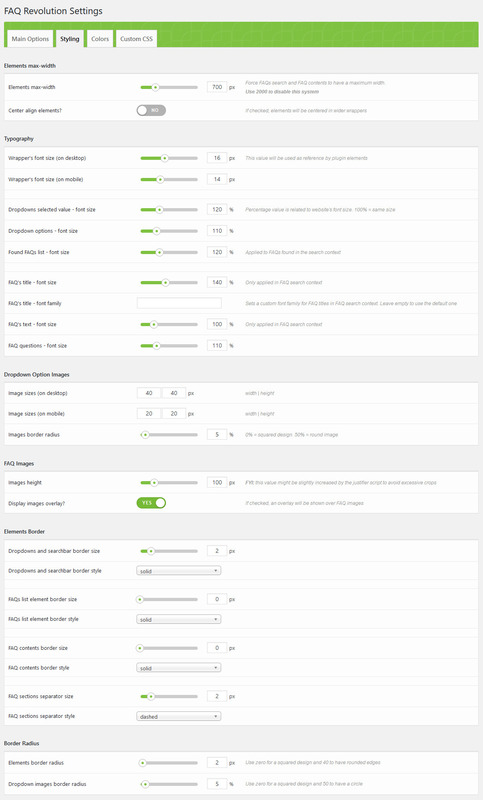 The whole plugin is designed to give you the maximum SEO score over FAQs and KB articles. 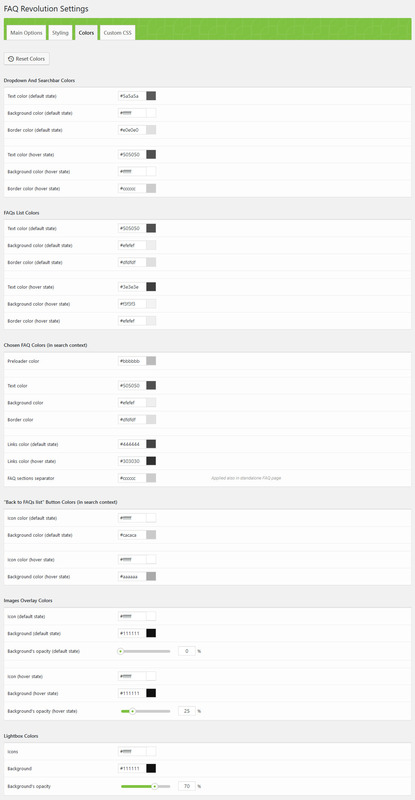 Each FAQ has also got its own page you can include into sitemaps to be quickly indexed. FAQ Revolution gives you the complete control over FAQ, KB and tags URL: this means you can also set their base-URL along with their slug. Finally, deeplink: you may have multiple “FAQ search” pages where each search step is deeplinked, allowing direct links to be made on the fly! Stop wondering what hides behind complex shortcodes and start using real-time previews! They are the state-of-the-art of modern wordpress page building, speeding up development. 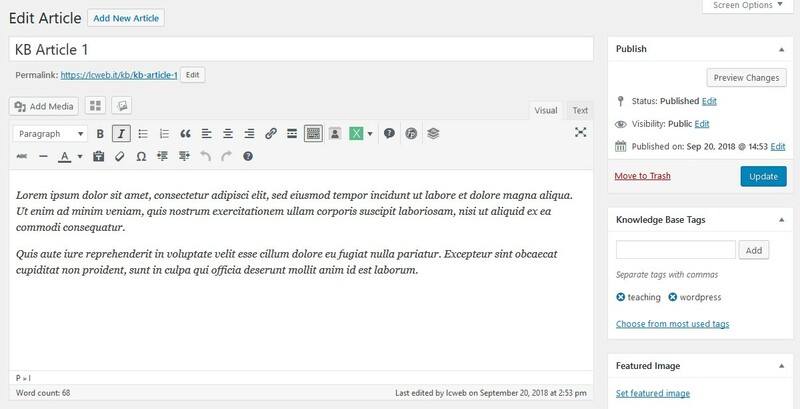 The plugin natively integrates with Elementor and Visual Composer, to give you the best user experience available today on wordpress. As per LCweb’s philosophy, each font and color can be managed, perfectly adapting to every website! Obviously the plugin is completely responsive: perfect on any device. FAQ Revolution is also completely translatable on both front and back ends. You will be able to localize it creating your .po file, using WPML or Polylang! Do you have a support system and want to integrate FAQs search? You can count on two dev-oriented PHP functions to query and search them! Please note that, at the moment, deeplink can’t be used in more than a language.